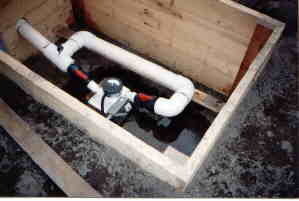 The Stream Engine is a breakthrough in hydro technology. This remarkable device employs a brushless, permanent magnet alternator which is adjustable, enabling the user to match turbine output to the electrical load. It is capable of outputs over 1 kW. It is equipped with a rugged bronze turgo wheel, universal nozzles (adaptable to sizing from 3 mm (1/8 inch) to 25 mm (1 inch), and a digital multimeter which is used to measure output current. The entire system is made of non-corrosive alloys for long life and durability. The Stream Engine is designed for use in battery-based power systems, with electricity generated at a steady rate, and stored in batteries for use at higher rates than is generated. During times of low demand power is stored. An inverter is used when AC power is desired. Water from a stream is channeled into a pipeline to gain enough head (the vertical distance the water falls) to power the system. The Stream Engine operates at heads of about 2m (6 feet) and upward. The water passes through a nozzle, where it accelerates, strikes the turbine wheel, and turns the generator shaft. Up to 4 nozzles can be installed on one machine. Typically, these systems operate at 12, 24, or 48 volts, with reconnectable wiring which allows the user to install a standard Stream Engine at most sites. Custom windings are also available which can produce high voltage (120, 240) at any site. To determine the power available at a site, head and flow measurements must be taken. Flow is the rate at which water moves, measured in liters per minute (I/m) or gallons per minute (gpm). This can be measured by channeling the water into a pipeline, then into a container of a known volume, noting the time it takes to do so. Head can be measured by using a transit, by siting along a level, or by using a pressure gauge at the end of the pipeline. It is important to keep in mind that output can only be accurately determined if head and flow measurements are made correctly, so care should be taken during this process. Energy Systems and Design offers system design services. Also available are "balance of system" components including batteries, inverters, and charge controllers. Batteries are an integral part of the self-sufficient energy system. Lead-acid deep-cycle batteries are usually used in hydro systems. Deep-cycle batteries are designed to withstand the repeated charge and discharge typical in renewable energy systems. Ideally, lead-acid batteries should not be discharged more than about half their capacity. Alkaline batteries, such as nickel-iron and nickel-cadmium, can withstand complete discharge with no ill effects. A battery bank does not enable users to live with all of the conveniences of modern living, as most appliances use high voltage AC (alternating current) while batteries can supply only DC (direct current). Inverters are used to convert DC into AC so that stored battery power may be used as needed by appliances and other loads. Modern inverters are available in almost every size, from small recreational to industrial types, and are designed for user friendliness, durability, and reliability. When the load demand is less than the generator output, power is available to charge the batteries. When the batteries are charged to capacity, the power is diverted to a secondary load, like a hot water heater. The diversion of the generated power is accomplished by using a charge controller. Many types are available to perform this function. Turgo - This rugged bronze turbine wheel is adaptable to a wide range of sites from 2m (6 feet) of head and up. 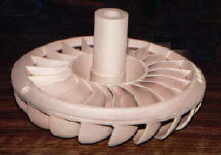 This wheel can handle large flows though it has only a 10cm (4 inch) pitch diameter. 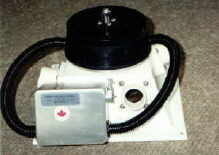 The turgo wheel fits a Ford or Delco alternator, with a 17mm shaft and a 1.25mm thread pitch (20 tpi.). Its approximate weight is 2.5kg (5.5 lbs), and is supplied balanced and machined. The Energy Systems and Design permanent magnet alternator has been designed specifically for micro-hydroelectric applications. With an output of 500watts/1000rpm, it is over 80% efficient at full load. Operating without brushes, and with its windings encapsulated in epoxy, maintenance is minimal, and usually limited to bearing replacement. The rotor is adjustable so as to enable the user to adjust the field strength. With a variety of wiring configurations, the permanent magnet alternator is ideal for most sites. It has a 17mm shaft and a 1.25mm thread pitch. Sealed ball bearings are used to give reliable performance and provide for easy procurement of spares. The Energy Systems and Design permanent magnet alternator is available in a series design (outputs up to 30 amps), a parallel design (outputs up to 60 amps), and a high voltage design useful for long distance transmissions (120 or 240 volt). They may be purchased separately, or with an aluminum junction box containing a terminal block for wiring, a rectifier, wiring lugs for connecting the wiring to the loads, and a shunt. A digital multimeter is supplied to measure current output. Energy Systems and Design has developed a new nozzle. It is conical in shape, with gradations marked on it which correlate to a range of nozzle sizes, 3mm (1/8 inch) to 25mm (1 inch). The nozzle is cut to the appropriate size and the end is sanded to a smooth finish. 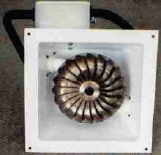 Turbine housings are made of cast aluminum, and powder coated white for lasting protection. The side walls are at an angle to accommodate the nozzles, in conjunction with the use of the turgo wheel. Turbine housings are available unmachined or prepared to user specifications. Before considering the purchase of a Stream Engine, perform the above estimate. If it is determined that your site is viable, contact Solareagle to discuss pipelines, transmission distance, and system voltage. Power from the Stream Engine is limited according to the available head. At about 7.5 m (25 feet), output is limited to 500 watts, 15m (50 feet) to 750 watts, and at a 30m (100 feet) head, 1000 watts can be generated, given adequate flow. The length, diameter, and type of pipeline must be determined in order to predict losses due to friction.